Okay so I am only writing this post right now at 23.50pm because Josh is making me, it’s already a day late by the time you’re reading this (sorry!) and I’m sat in bed in Budapest cursing myself for not being more organised. As I am on holiday I thought it would be apt to share my top airport tips, as I know lots of people are heading off on holiday anytime! Now I’m not scared of flying but I do like to be at the airport a hefty amount of time before the flight. As I mentioned in my Father’s Day Blog Post I have inherited this from my Dad and I now get very stressed if I’m not there 3 hours early. The best thing I can suggest if you are the same is to just go early, if it will put your mind at ease to go early- even if you can’t check in yet, just do it. You can usually see online when your checkin in will open, if it doesn’t already state on your boarding pass….which leads me to my next point. They offer this for a reason, if you want to get sat together, check in as soon as possible to avoid being split up from family members. It also quickens proceedings at the airport where the check in lady doesn’t have to print out boarding cards for your whole party at the desk. On a similar note I always print boarding passes for the airport, I have used my phone before but I have found this method to be problematic in some airports- something you don’t want to have to deal with, with a language barrier. If you wanna go full blown airport-nerd you could print all your holiday documents and organise them in a folder in the order that you will need them, eg. Airport parking reservation, boarding passes and passports, transfer voucher, hotel voucher and return boarding passes (…no I don’t do this…). In another similar vain, remember to pre-book your airport parking so you can literally drop off your car keys and go. I would strongly suggest layers as quite often flights can be extreme temperatures and you can also get pretty warm lugging your suitcase around the airport, something like a hoodie, can also double up as a pillow if you fancy a kip on the plane. Another word on clothes, avoid laced and buckled boots (Unless it’s the middle of winter) as it will save you time having to remove them for security. Alongside these, avoid clothes with metal details, excess jewellery and buckled belts- no-one wants to be frisked at 5.30am just because they forgot to take their Pandora bracelet off. This one is a judgement call and will obviously depend on the length of the flight but try to pack the most minimal hand luggage you can. 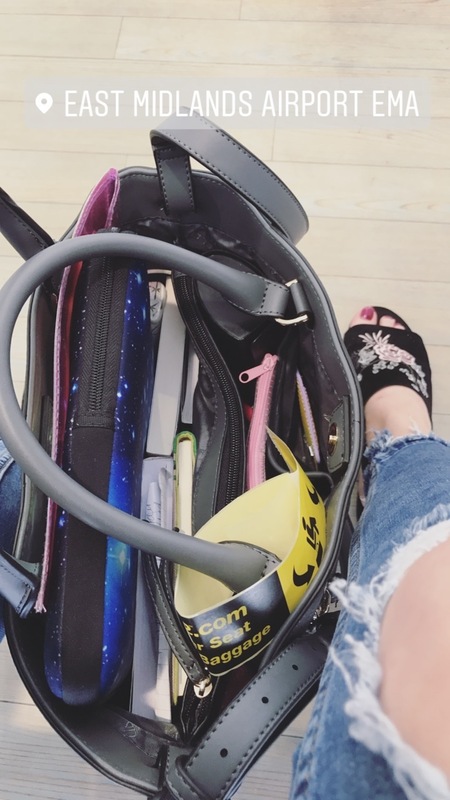 I know some nervous flyers like to take their home comforts or use the time as a pamper session, but for me adding this excess stuff ( and weight) only adds to my airport stress. For one, lots of stuff makes the bag heavy and therefore, quite likely uncomfortable- don’t forget you have to carry this bag through your transfer or onwards journey to the hotel. If the flight is long haul then obviously pack enough to do/ read but if you’re flight is an hour to Amsterdam you don’t need 3 books. Don’t forget to pack any liquids under 100ml in a clear plastic bag, you can buy these from the airport or Boots etc. 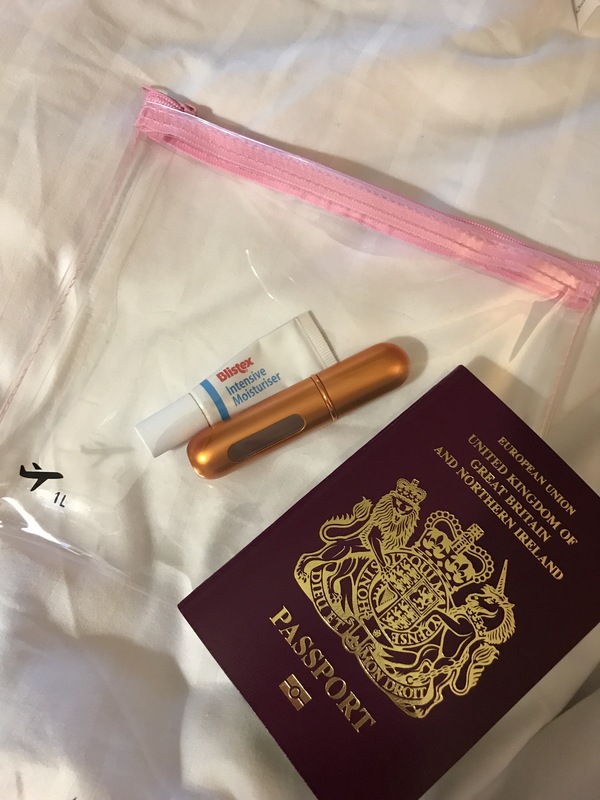 Unless only travelling with hand luggage, I like to keep the bag to the minimum, for example on this trip I just had a lip balm and a small perfume tube in my handbag. Another handy tip for liquids is to unscrew the lids and apply a square of clingfilm over the hole and then re-screw the lid. This way even if a lid comes undone during the flight hopefully it won’t be spilled everywhere (this also works well in hold luggage). -Destination tour guide book to look for ideas/ learn a few phrases. -Portable phone charger (especially for long-haul flights). -Laptop and Charger- if taking, this needs to be in hand luggage not hold luggage- why not pre download some films or tv shows to watch offline. 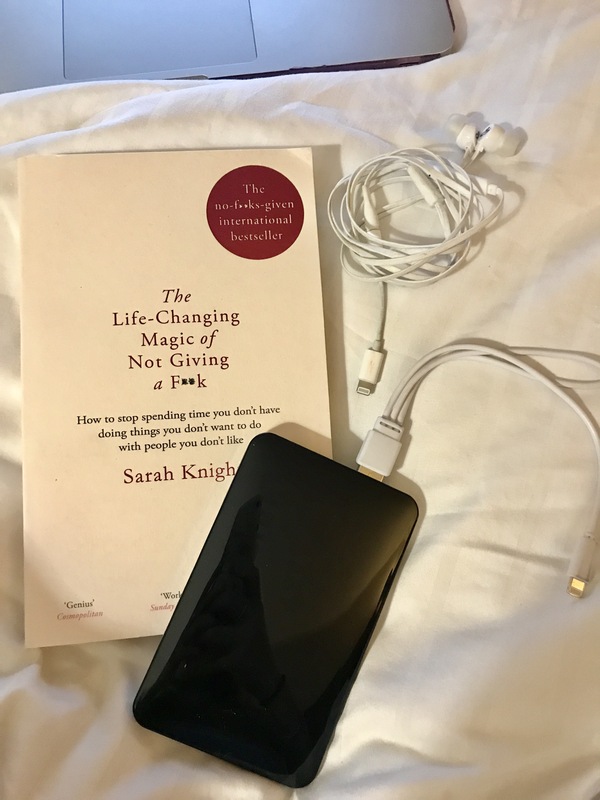 -A book- this holiday’s book of choice is “The Life Changing Magic of Not Giving a F**k” by Sarah Knight. I followed all my rules- enjoyed duty free by buying this bag, packed my laptop and my document folder and book (or 2). 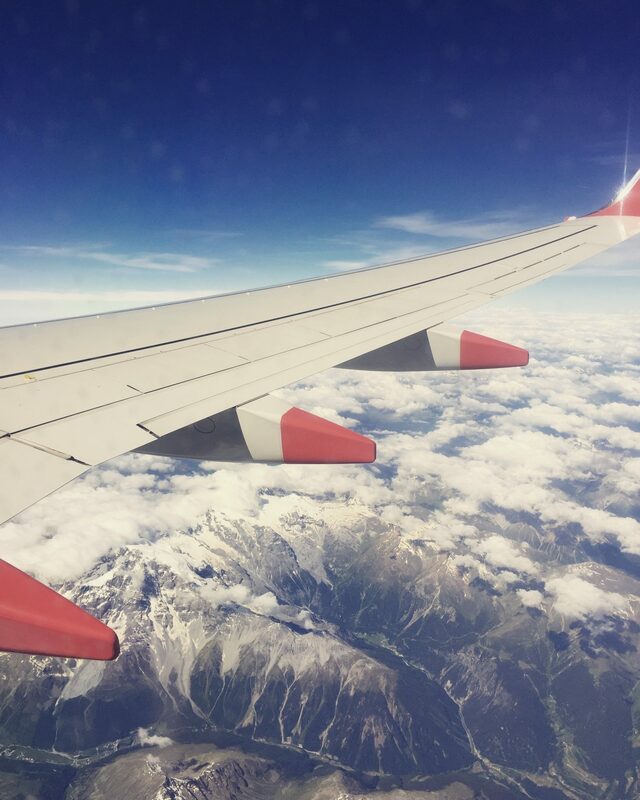 Don’t let the stress of getting through security ruin the start of your holiday, the plus side of being early means you can have a nice meal or coffee before you fly and can also enjoy all the shopping facilities to bag yourself a bargain! Hopefully this has been of some use, let me know if you have any handy airport tips in the comments below! Definitely agree about being on time. I’d rather be way too early than be stressing about missing my flight. And it’s amazing how cold you can get on a plan and how sweaty you can get lugging a backpack around. This time I packed extra socks in my bag because I was wearing sandals and then I got on the plane and it was roasting hahah you just never know! Go figure, eh. Sometimes you just can’t win. It’s my most important one as I’m always cold hahaha! Haha I always remember so much stuff I’ve left out of posts after I’ve published them!